Perforate St Johns Wort (Hypericum perforatum): growing, planting, caring. A shrub that's super-easy to grow. Hypericum perforatum - perforate St John's-wort - is a flowering plant in the family Hypericaceae. It is a herbaceous perennial plant growing up to 1 m (3 ft 3 in) tall, with extensive creeping rhizomes, opposite and stalkless yellow-green 1–2 cm (0.39–0.79 in) long leaves with scattered translucent dots of glandular tissue, giving the leaves a "perforated" appearance, and bright yellow flowersr in helicoid cymes at the ends of the upper branches, between late spring and early to mid summer. Wild St. John's Wort produces semi-evergreen, lanceolate or oval, dark green, finely perforated leaves. The flowers are yellow, in terminal clusters, with five petals. The shrub is about 1.5 m tall. Plant St John's wort during its rest, preferably between November and March, in well-drained soil, in the sun or semi shade. Plant with a significant spacing with its neighbors as it tends to widen from the base. Water well after planting. No need to water, except for the first month if you planted late in the season - and of course in case of drought. 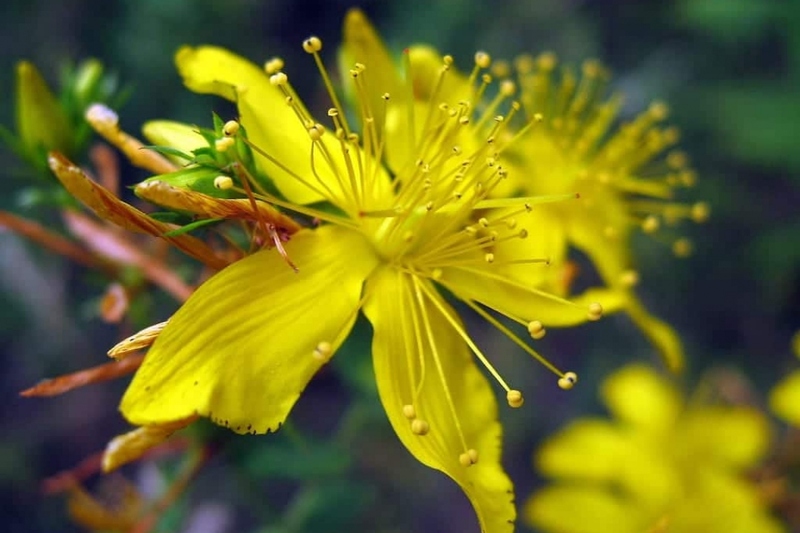 St. John's Wort fears rust, which stains its leaves. It does not matter, but you can cut off the sick parts and burn them. The pruning method varies according to the type of St. John's wort: prune those that are persistent simply by removing the end of the branches that compromise the symmetry of the shrub, and remove the faded flowers after flowering. For the deciduous, cut the branches entangled at their base, during the winter. Mulch between the shrubs on a few cm thick with crushed wood. For evergreen species, in a harsh climate, mulch a second time before winter.